RadioRA2 - Technical Comfort, Inc. Your home becomes more beautiful the moment you begin living with the RadioRA2 system. Lutron has thought of everything with this extremely powerful, yet easy to use home automation system. RadioRA2 allows you to control your entire home in ways you’ve never thought possible, but with a focus on style and beauty. Once you see what it’s all about, you are sure to want it in your home. Wall mounted controls will be placed exactly where you want them (and where your friends and family will expect them to be). Tabletop keypads can go just about anywhere, and Pico remotes can fit in your pocket or palm as easily as on a nightstand or end table. More style and design options are at your fingertips as we work together with you or your interior designer to create clean, beautiful accents to your home with Lutron’s RadioRA2 Controls. Whether your home’s design is classic or contemporary, you won’t feel limited by what Lutron has to offer. Roller Shades -- precision control of daylight with near-silent operation. Battery-powered, if you wish. Honeycomb shades -- Get Superior insulation and luxurious textures and colors, also available battery-powered, if you wish. Drapery Track systems -- Do you prefer the traditional look? Then these draperies may be the right choice for your decor. Kirbe Vertical drapery systems -- These draperies lift vertically for an unobstructed view. Wood Blinds -- Raise and lower the blinds and tilt the slats to create just the right view and allow in precisely the right amount of light. Horizontal Sheer Blinds -- Love the elegance of a sheer but want the precision of a blind? Then this is the choice for you. Roman Shades -- They’ve never been quite so reliable, smooth and quiet as these automated shades. Tensioned Shades -- An excellent choice for skylights and angled windows, these shades give you reliable control of daylight and temperature. Not only does RadioRA2 look beautiful, but it helps you save energy, too. Lutron has approached energy consumption from almost every angle to help you not only reduce your own utility bills, but to help our planet as well. Scheduling -- Everything on a schedule (with seasonal adjustments) opens and closes blinds, shades and drapes, adjusts temperature, and turns off lights when you don’t need them. Control natural light with shades -- Why heat or cool the inside of your home when the outside sunlight or shade can do it for you? Occupancy sensors -- Lights can turn off automatically when you’re not there to use them. Temperature control -- Integrates with your existing electronic thermostat, or Lutron’s own. LED Lighting -- Lutron’s RadioRA2 is as comfortable with efficient LED lights as with any other kind of light. Dimming -- Why use bright lights when you don’t need them? Wireless Temperature sensors -- Enjoy much more precise control of the heating and A/C based on the temperatures in different rooms in your home. Lutron works with all the top manufacturers to ensure that their systems integrate reliably with a wide variety of remotes and automation systems. Plus, RadioRA2 can control your garage doors and integrate with your home security system. Is RadioRA2 Right For You? With all Lutron’s RadioRA2 can do, there’s a good chance that it’s a great match for your home. Because Lutron’s RadioRA2 relies on proprietary RF technology, it is an excellent solution for retrofit or new construction projects of homes up to 7,500 square feet and with up to 200 devices. We can explore the possibilities of a RadioRA2 system in your home. 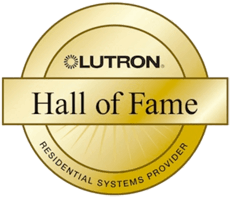 Whichever Lutron system you select, we will design the perfect system for you, install it perfectly, and program it to work beautifully, just as you imagined. If you’re planning a remodel or new construction project, contact us early. We’re always busy and in-demand, so please call us early so we can schedule time for you. Our office is conveniently located in Laguna Niguel, close to all of Orange County and surrounding areas.